I swear I will use peonies any chance I get and I’ve never met a bride who wouldn’t jump for joy to hear they’re in season for her wedding date. So you can imagine my excitement when Danielle and Teagan turned the tables on me and told me that they have a family friend peony farmer who had volunteered to supply the peonies for their wedding and I was the one jumping for joy. What a treat. 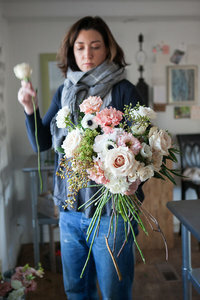 Local peonies just for them (and ME!). Even with all of those peonies on my mind, Danielle’s vision for their wedding circulated around seasonal greenery and her color palette of dove grey, white, and navy blue. 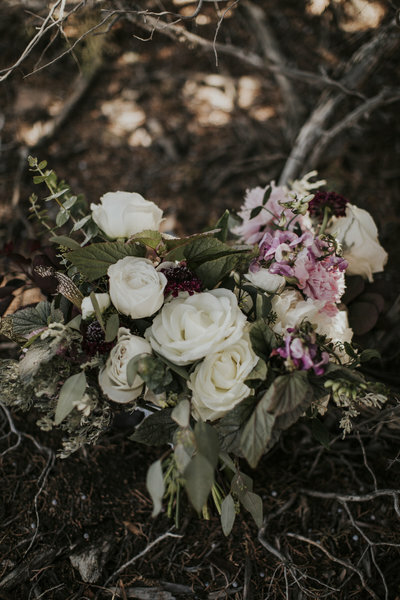 I chose blueberry branches, spray roses, baby eucalyptus, ranunculus, delphiniums, blue eryngium, deflexus, olive branches, white wax flower, queen anne’s lace, oregon grape, and green viburnum to bring everything to life for their day. 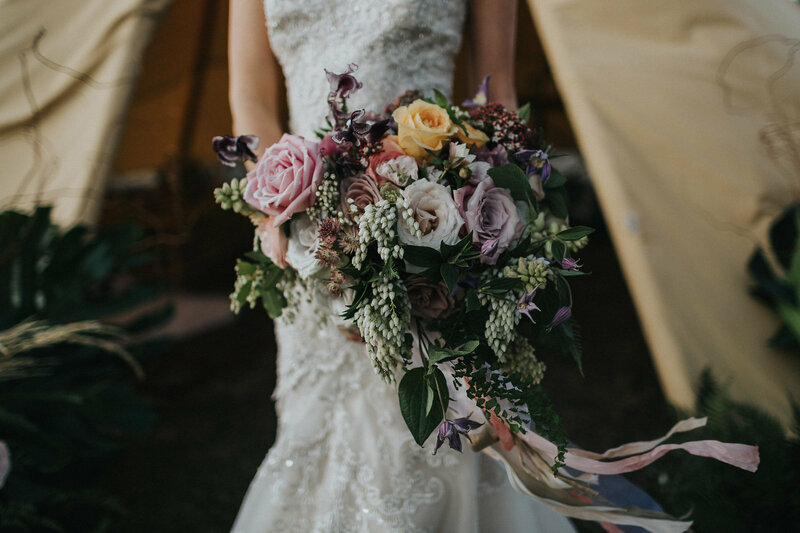 Danielle’s organic bouquet was finished with grey silk satin, organdy, and shantung ribbons to coordinate with her girls’ dresses, while their bouquets were finished with navy blue silk ribbons to compliment what Teagan and his guys were wearing. The guys’ boutonnieres were finished with a narrow grey silk ribbon wrap so that they popped against the navy of their suits. Each of their mothers and grandmothers chose their preference of a traditional pinned corsage or a modern corsage cuff to compliment their wedding day ensembles all lovingly made with delicate elements. The couple chose to marry in front of a reclaimed wooden arbor with Mt. Bachelor as their backdrop. I created a romantic garden-inspired installation that appeared to organically have grown upon the arbor just for their ceremony. After their ceremony, guests were welcomed into the Great Hall where each table featured romantic centerpieces in gold mercury glass compotes. Visually anchoring the room was the couple’s sweetheart table with the iconic Great Hall fireplace as its’ backdrop, dressed with an organic garden-inspired mantelpiece full of lush blooms and greenery. I love all of these images so much and how sweet the two of them are together. Their clean, classic color palette was the perfect compliment to Sunriver’s green landscape and rustic architecture. Don’t you love Danielle and Teagan’s mix of clean and classic with rustic too?